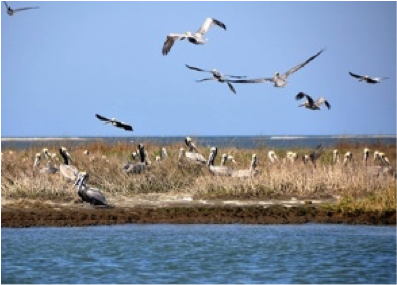 Brown Pelicans nest on the eroding Beacon Island. Photo Credit: Todd Miller. 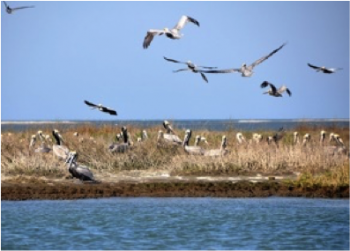 Beacon Island in Pamlico Sound is one of only nine remaining nesting sites for brown pelicans in North Carolina. 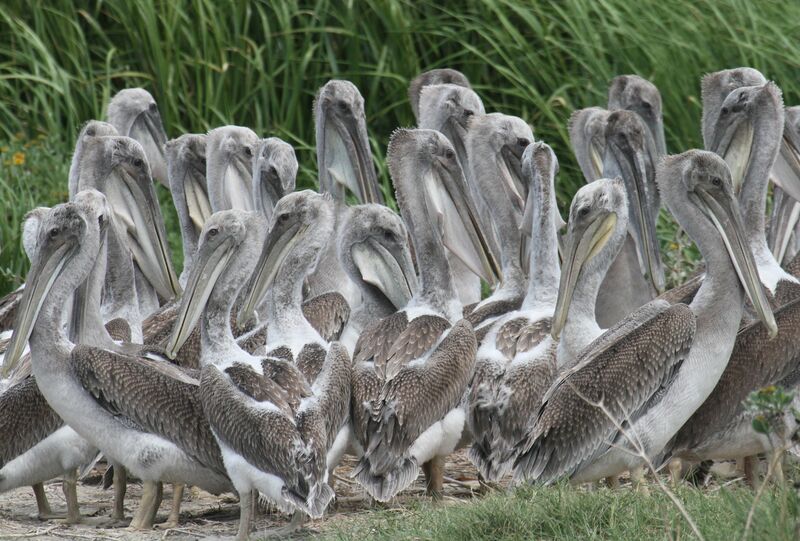 In 2014, the remote 7.5-acre island, owned by Audubon North Carolina, supported 558 nesting pairs of pelicans, about 12 percent of the state’s population. Much like similar sites around the state, the shoreline of Beacon Island is shrinking due to erosion caused by storms and boat wakes. 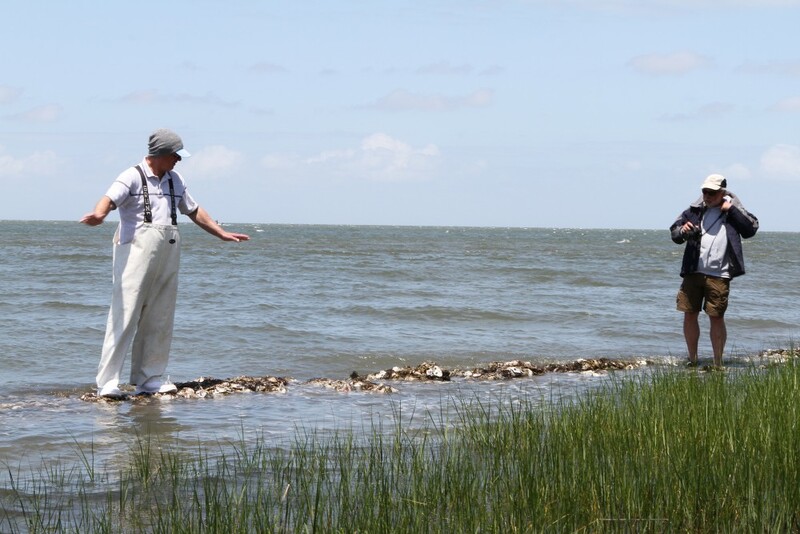 Fisherman and federation board member James Barrie Gaskill stands next to a section of oyster shell bag marsh toe revetment at Beacon Island. 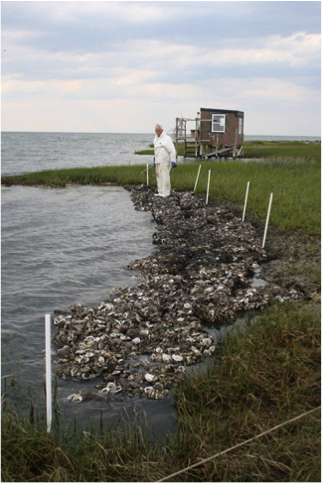 Resources Partnership to help restore the eroding shoreline using oyster habitat restoration practices. 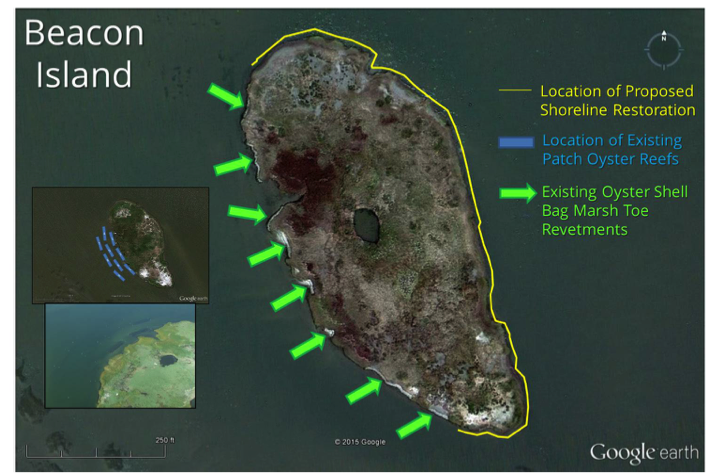 Federation staff and its partners have used inventive coastal restoration techniques to create a series of marsh toe revetments and patch oyster reefs around Beacon Island that are helping to slow erosion. To date, 393 linear feet of marsh toe revetments and nine patch oyster reefs have been created on the western side of the island. A marsh toe revetment is a type living shoreline in which rocks, or in this case, bags of oyster shells, are placed up against the eroded marsh edge. 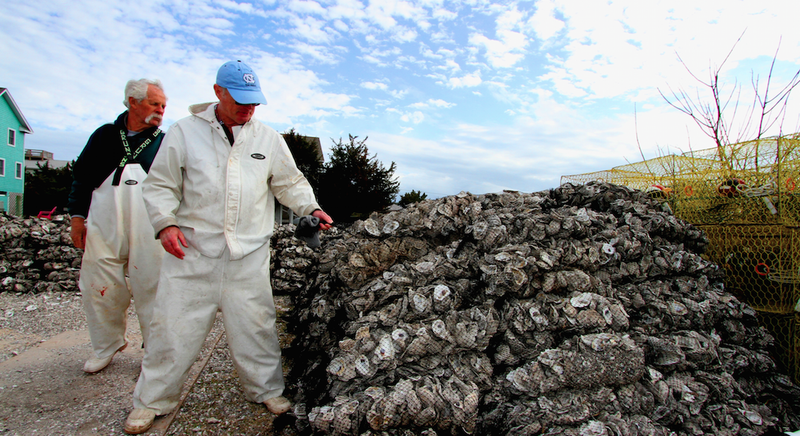 Patch oyster reefs are created by dumping loose oyster shells directly into the water. Not only do the shells help to reduce erosion by slowing down waves, they also provide a hard surface for oyster larvae to attach to and grow, thus creating new habitat for finfish, crustaceans, and mollusks. With this work accomplished, the focus has shifted to restoring the more dynamic eastern shore of the island, where water depths and wave energies are significantly greater. Currently, a variety of restoration strategies are being explored to devise the best approach to reduce shoreline erosion along the eastern side of the island.